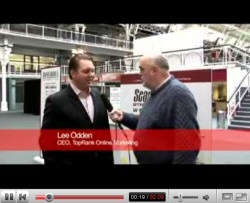 At the Search Engine Strategies conference in London February 21st, TopRank’s CEO Lee Odden was interviewed by Greg Jarboe on blog and news SEO for Incisive Media, parent of the SES London conference. Odden gave presentations on the news and blog optimization panels and moderated the reputation management session. Watch the full Lee Odden SES London interview on YouTube. TopRank has worked with companies across the United States to develop solid online marketing programs focused on increasing sales and brand visibility. Expertise ranges from digital asset optimization to SEO to online public relations.